This is maybe the first one of these challenges that the average person might not have materials on hand for. I really want them to be accessible, easy things for people to try mostly with whatever they have on hand and that can be completed the day you read about them, but that’s not always going to be the case. And really, you can paint on any kind of fabric with regular old acrylic paint, too. You don’t have to have special fabric paint. 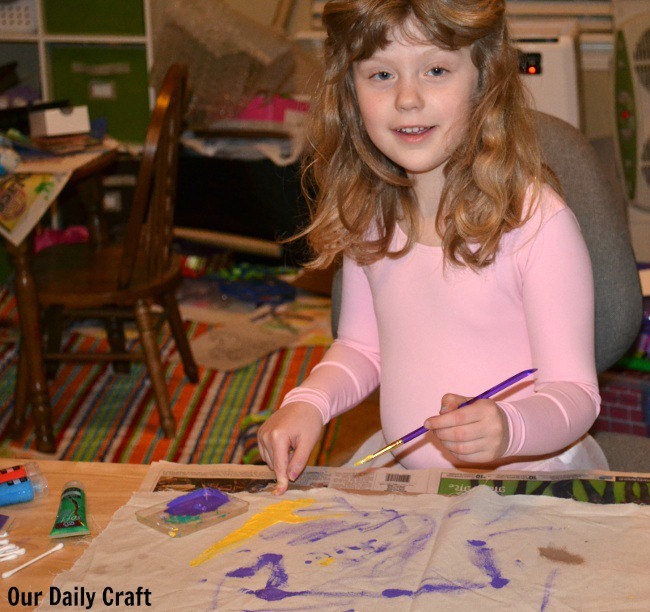 I do have fabric paint, though, because we’re getting ready to make the girl’s 100th day shirt. She wanted to do dots, so we have 10 different colors of fabric paint so she can have 10 dots of each of 10 colors. When this girl has a plan, you’d better not get in her way. We tested different methods for making dots, using paintbrushes and Q-tips and just dropping paint on the fabric. And then there was just random playing. Which is why it’s so great to create with kids. She learned that purple and yellow make brown. It was good. And then of course I had to play. Painting with fabric paint is not as easy as I thought it would be. It would definitely take some practice to get things to turn out really the way you want them. But it’s fun because it’s a completely different feeling from painting on paper or canvas. And when you’re done, maybe you can make something out of the fabric, too. I haven’t decided about that yet. 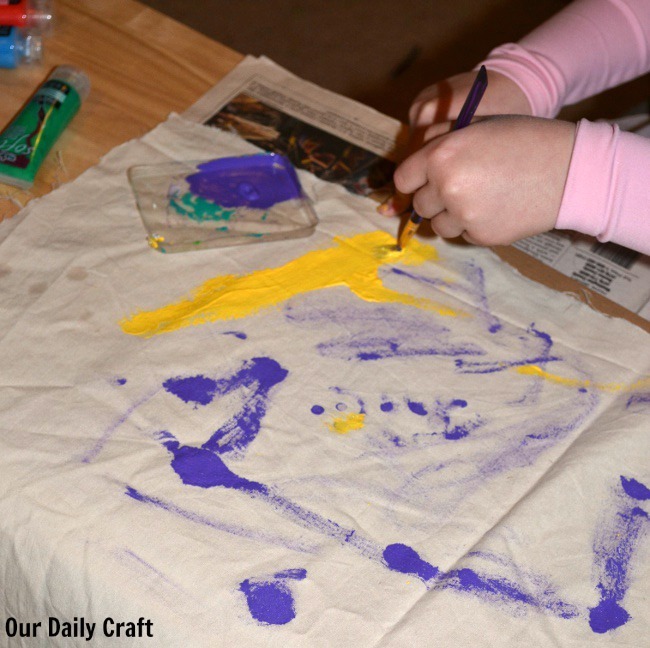 Have you ever used fabric paint? I’d love to hear what you think of it. This is not the puffy stuff of our childhoods (though you can still buy that, too)! If you try this challenge, as always, I’d love to see what you came up with. 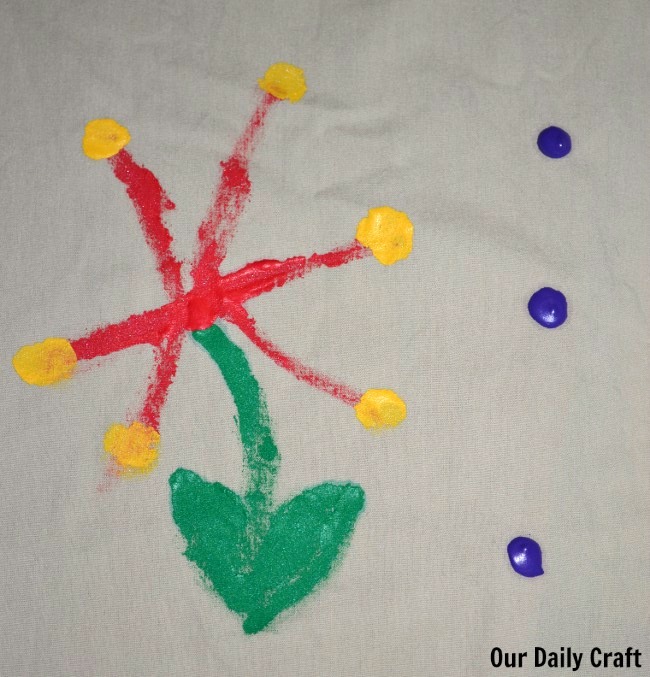 Add the tag #ourdailycraft to your posts!